The Cities Alliance partnership features a broad range of members with a global focus. The core work of the Think Tank is to continuously refine a compelling narrative on Africa’s urban transition that can shape debate and drive action towards effective urban policy responses in Africa. Urbanization has the potential to radically shift the development trajectory of the African continent. Currently the world’s 100 fastest growing cities are in Africa and uniquely the region has the highest urbanization rate in the world and this will persist for the foreseeable future. By 2035 it is estimated that 50% of the continent’s population will be classified as urban. Until recently many African governments were in denial about the reality and potential of urbanization. This has changed in the run-up to Habitat III as reflected in the Africa Common Position adopted in 2016 under the aegis of the African Union. The Cities Alliance partnership features a broad range of members, including: local authorities, national governments, non-governmental organisations, multi-lateral organisations, and Associate Members with a global focus. 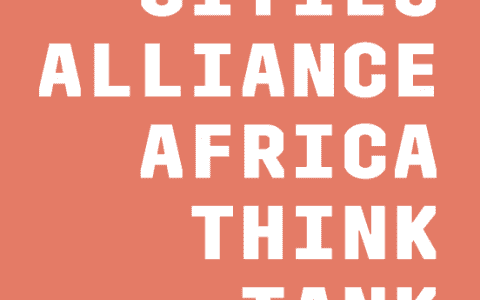 The partnership has decided to prioritise Africa in its programming and in light of the unique complexities of urbanization on the African Continent, it established the Cities Alliance Africa Think Tank. The primary purpose of the Think Tank is to be a critical friend to the Cities Alliance Partnership as it seeks to sharpen its programming. The African Centre for Cities at the University of Cape Town convenes and supports the Think Tank. Contribute substance and direction to the Cities Alliance Africa Strategy through strategic reflection, analysis and recommendations on urban challenges and new trends. Promote and inform international public debates on urban policy, and develop a pro-urban narrative that highlights the role of cities in the structural transformation and sustainable development of Africa. Map stakeholders in Africa’s urbanisation, detailing the key institutions and individuals capable of influencing a shift in thinking and practice on African cities, and identify targets for the Think Tank’s policy outputs and partnerships. Provide greater visibility for the urban debate in Africa at development dialogue forums that will flow from the New Urban Agenda, and actively guide the implementation of the African Union’s Agenda 2063, the Sustainable Development Goals (SDGs—specifically Goal 11), Paris Agreement, and related sustainable urban development initiatives. Produce position papers and policy briefs on Africa’s urban development. Conduct research into urban innovations, including the setting up of a repository of innovations.